Tässä atc-kortti nimeltään Magic. Tehty Fun with atc:s haasteeseen #86, jossa teemana on magic. Yksinkertainen kuten korttini melkein aina ovat. Tyhjä tila kortissa miellyttää minua. Here is my atc-card to Fun with atc:s challenge #86: magic. This card is very simple, I like "empty" space on cards. 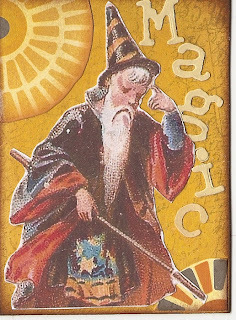 Lovely golden colours, and your wizard is a great image. Thanks so much for playing along with us at Fun With ATCs. lovely image of the wizard, he reminds me of terry pratchett's rincewind.